Plainfield, Indiana is in Hendricks County, a part of Washington, Liberty and Guilford townships. It was one of the first areas settled in the central part of Indiana during the 1800s and incorporated in 1839. Many Quakers had settled in the area giving the town its name as they were known as ‘plain’ people. It continued to grow as a result of being a stop on the Vandalia Railroad, as well as being established along the National Road U.S. 40. The town has a population of approximately 31,409. If you’re looking for some interesting things to do, check out the Chateau Thomas Winery. Here they combine the science of winemaking with the art, and it has become a world-renowned winery. They have tours of the winery and events for wine tasting. If you want something to remember your trip, they also have a gift shop. Art lovers will appreciate the Sketch Pad Art Studio. Original creations by Plainfield artists can be seen at the gallery, and art classes and summer camps are made available. For those who love water experiences, the Splash Island Family Water Park has a professional lap pool, large slides, and a lazy river. There is an indoor and an outdoor section so that there is something to offer year-round. The Al & Jan Barker Sports Complex is a 58-acre site that hosts a variety of team sports. The complex has two football fields and one practice football field. It also has a total of 13 soccer fields of different sizes, as well as five baseball fields, plus concession stands. The diverse real estate in this historic area provides older single-family homes on large yards as well as new luxury homes in planned neighborhoods. You will find traditional wood sided homes as well as brick ranches, and multilevel vinyl homes. New homes offer a variety of modern styles, and building sites are available. The community is divided as residential, industrial and retail, but maintains easy accessibility. The small-town feel is a draw to many who want to escape big city life, but the ten-minute drive to Indianapolis guarantees that amenities of the big city are still available. This area is rich in history and offers both cultural and recreational opportunities, making it a great place to raise a family. 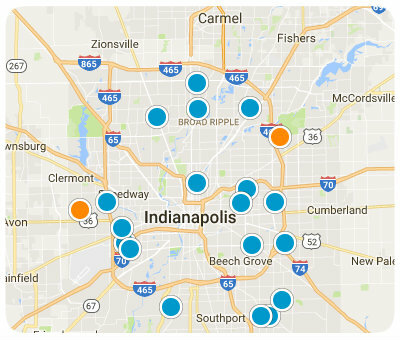 Knowing the variety of amenities, the area has to offer, it is a must-consider destination for homebuyers in the Indianapolis area. If you would like more information on homes for sale in Plainfield, Indiana, please contact us today and allow us to assist you.